Readers of this blog may remember this post about the process we started a while back: Whilst the pears on our trees were still very small, we placed them inside bottles, leaving them to grow there. 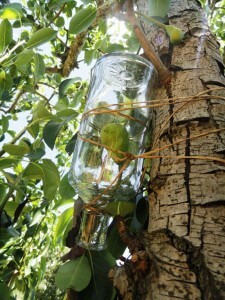 Well, things have moved along, and this Tuesday we harvested the pears – now grown full size inside the bottles – and we started the process of creating pear brandy. We started by cleaning the bottles on the inside with a sterile solution, after which we filled them up with one of three alcohol solutions, namely: clean Vodka, pear distillate, and plum distillate sweetened with fructose. We’re letting the pears stand for a while before we sample the results, and once we’ve decided which combination works best, our pear brandy will be available for sale in the farm shop. post, while I am also eager oof getting knowledge.